Known for its anti-corrosive and heat-resistant properties, N08904 stainless steel is a high-alloy steel which is used for a number of different applications. While, these days, it often takes a back seat to duplex stainless steel, it still has a place in this world. Also known as alloy 904L, it’s equal parts tough and moldable. Wanting to learn more about N08904 stainless steel? This article has you covered. What Does N08904 Stainless Steel Consist Of? 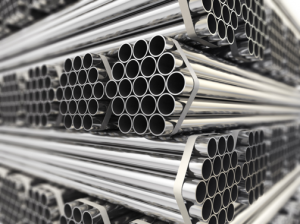 Classified as an austenitic stainless steel, N08904 stainless steel is an alloy which is low in carbon content, but high in nickel and molybdenum. In addition to this, it is also contains above-average amounts of copper. These ingredients work to give N08904 stainless steel excellent resistance to acid and rust corrosion. What are the Characteristics of N08904 Stainless Steel? While it’s not the most commonly used stainless steel on the market, N08904 stainless steel is still functional enough to serve quite a few purposes. Its functionality is characterized principally by its ability to resist destruction. Let’s discuss its exact characteristics below. One of N08904’s characteristics is that it does a great job of withstanding heat. While it will structurally buckle under very high temperatures (over 750°F), it generally never oxidizes. Because of its heat-resistant properties, this steel can be heat treated. This allows it to be manufactured exceptionally hard, making it very durable, and protecting it against physical trauma. As was noted above, N08904 stainless steel offers fantastic resistance to acid and rust erosion. This allows it to be put through a number of different situations through which many other stainless steels can’t be put. Not only can it withstand the effects of saltwater, it thrives when being welded as well. If you’re looking for corrosion-resistance in your stainless steel, N08904 is a great option. In addition to being corrosion-resistant, N08904 stainless steel is also quite malleable. Capable of being formed in a number of different shapes, it can withstand very high heat. It should be noted, however, that N08904 stainless steel is not the most malleable stainless steel on the market. Because of its hardness, it does have limits as to how it can be shaped and manipulated. N08904 stainless steel is treasured by many for its ability to be welded. Whereas other stainless steels become discolored and misshapen when being welded, N08904 holds firm, never losing its color or its structural integrity. Again, this doesn’t mean that it’s the most weldable stainless steel on the market. However, if you’re looking for a combination of malleability, corrosion-resistance, and weldability, it’s about as weldable as you’re going to find. N08904 stainless steel isn’t used as much as some other stainless steels, but it still serves plenty of purposes. Every alloy GPS carries is in the shape of pipe, fittings, and flanges. I’d leave that out. My recollection is that it was mostly the petro/chemical industry for corrosive chemicals. Although this might be true, GPSS doesn’t carry anything for that purpose. The paper industry is a keeper. You will also often find it used in the paper manufacturing industry. Because of its resistance to corrosion, you’ll also often see it used in the oil industry. Not only will it resist corrosion due to oil, but corrosion due to seawater as well. Looking to Purchase N08904 Stainless Steel Products? Do you have a use for N08904 stainless steel? Looking to purchase N08904 stainless steel products? If so, we here at Great Plains Stainless are the people to call. Whether you are looking for stainless steel bars, tubs, plates, or fittings, we can accommodate you. We’ve got products of all different sizes.